WESTBROOK — While initial estimates indicated it could be another two months before the Westbrook Community Center could fully reopen following an electrical fire Monday, city staff now hope the building can be fully operational within the next two to three weeks. Within 24 hours, thanks in large part to an outpouring of community support, nearly all the center’s tenants had found temporary locations to set up while repairs are made to the building. “The outreach has been fantastic. That is so important in a time like this,” Mayor Mike Sanphy said. “I never thought we’d have so much settled and relocated, and relocated in a suitable location, so quickly,” City Administrator Jerre Bryant said Thursday morning. The fire, which started in the electrical room, was first reported around 6:45 p.m. Monday, and when firefighters arrived, the entire building was filled with smoke. Fire crews were able to contain the fire to the electrical room using dry chemical extinguishers, said Westbrook Fire Chief Andrew Turcotte. Turcotte estimates the building sustained at least $100,000 in damages, mostly to the electrical system, but some parts of the building also had smoke damage. Bryant said he expects the repairs to cost the city $5,000, its insurance deductible, with the rest picked up by insurance. Turcotte said there were “a couple dozen” individuals in the community center at the time of the fire and all were able to get out safely. 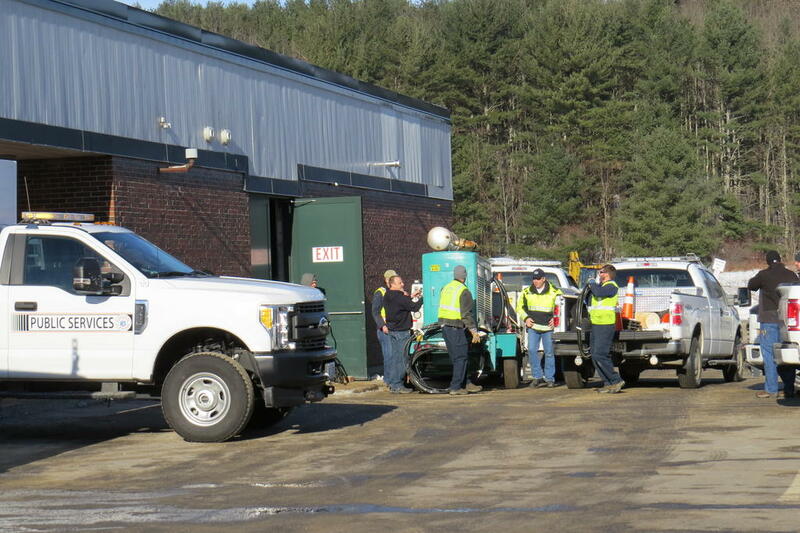 Acting Community Services Director Greg Post said the quick action of Madison Damon, a 2018 Westbrook High School graduate and University of Southern Maine student who was the building attendant on duty, played a critical role in mitigating damages. “It was those that were there at the time and immediately afterwards that made the difference,” Post said. Heat was restored by Tuesday afternoon and other equipment needed “to get the building back on line” is on the way, Post said Wednesday. A temporary electrical service will be put in place, which “will allow the building to function at almost full capacity” within the next few weeks, he said. It will be longer until the pool is reopened. “The problem with the Davan Indoor Pool is because it uses so much electricity, we won’t be able to open that until the building is fully repaired,” Post said. Post said he started fielding calls from people wanting to help with temporary homes for programs and services even before he left the scene Monday night. The Meals on Wheels program will be operating out of the Westbrook Little League facility across Bridge Street. Before- and after-school care will be staffed by community center employees at the individual schools the students attend. Adult Education classes will move to the Intercultural Community Center, 36 Patrick Drive. The North American Arab American Organization will use space at the high school, and the general assistance program will operate out of the Westbrook Public Safety Building at 570 Main St. The Westbrook Food Pantry is still trying to figure out its next steps, said Director Jeanne Rielly. Many churches in the area have offered up space and the Sagamore Village Food Pantry and Stroudwater Christian Church Food Pantry in Portland “have offered to help Westbrook clients,” she said. The Stroudwater pantry, at 1520 Westbrook St., has invited Westbrook families can come pick up food between 1 and 3 p.m. Sunday, Jan. 20 and will also open its pantry for Westbrook clients on Tuesday evening. Rielly said the Good Shepherd Food Bank on Tuesday from noon to 1:30 p.m. will have a mobile food pantry in the community center’s parking lot with food for 100 to 125 families. Rielly hopes to be back into the community center by Jan. 29. “It’s looking more promising,” she said Wednesday afternoon. Some organizations, as of Tuesday, were still looking for a interim locations, including Brio Dance Studio, Global Premier Soccer and Westbrook City Band.The recreational basketball team will practice in Congin School Saturday, but a location for future sessions is still being determined. A number of the community center’s fitness classes, including the weekday and Saturday sessions of silver cardio, pilates, train your inner athlete, yoga, barre and spin classes have been relocated to Presumpscot Commons at 22 Foster St., although not necessarily at the normal times. There will be no Sunday programming for the time being. Members of the Westbrook Public Services assess damage to the Westbrook Community Center after an electrical fire Monday at the 100,000-square-foot facility. Meals on Wheels meals are assembled by the Westbrook Community Center’s pool/gym entrance Tuesday morning. Because of an electrical fire the previous evening, the program will temporarily operate out of the Little League facility across the street.